Have you ever hugged a famous poet? I have. Well, two famous poets, but I don’t want to brag. Such are the perks of interning for Pacific University’s MFA in Writing program, one of the top five rated low residency programs in the nation (Atlantic Monthly). I mean, sometimes I took famous poets to New Seasons Market, and sometimes I took them to the airport where I had to say goodbye. And sometimes these poets taught this prose writer a thing or two she didn’t know before, like how to elicit emotion from the sound of a single word. Later, when I became an editor, the education didn’t stop either. Although the stigma of the editor is to teach the writer not to make mistakes, writers also have something to teach editors. This is often unbeknownst to the editor—that’s why my advanced editing professor made us interview published writers on their experience with editors. At the time, I had wracked my brain as to who I could interview, but it came to me: who better than a poet whom I had once hugged? 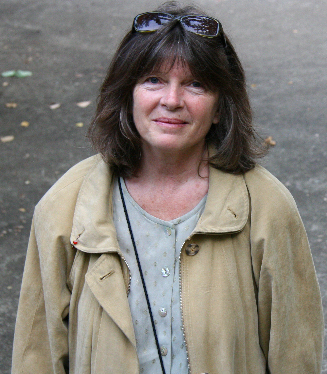 Dorianne Laux. Below is an excerpt from the interview I had with Laux, which is now available in Volume 6.1 (Spring 2011). I met poet Dorianne Laux when she was a guest writer at Pacific University. During her visit, she directed a poetry workshop I attended. It quickly became apparent she is a no-nonsense tough critic with a poet’s heart. I followed up her visit with an interview. Dorianne, a prolific writer, has published a chapbook, Superman: The Chapbook (2008), The Poet’s Companion: A Guide to the Pleasures of Writing Poetry (1997) as a co-author with Kim Addonizio, and four other books of poetry: Smoke (BOA Editions, 2000); What We Carry (1994), a finalist for the National Book Critics Circle Award; and Awake (1990), nominated for the San Francisco Bay Area Book Critics Award for Poetry. Her latest full book of poetry, Facts About the Moon (W. W. Norton 2005), won the Oregon Book Award. Since poets seem to have more freedom with their work than other writers, I wondered how much choice they have regarding the titles of their poetry collections. My understanding is that generally publishers pick a title they think is marketable, but since poetry has such a small market, Dorianne says that she typically gets to pick her own titles too, though she says “I have been over-ridden. I was going to call my first book Skipping Stones and my friend, the great poet Philip Levine, said ‘What about Awake?’ I loved it immediately. Al Poulin was concerned that it might be confused with the monthly illustrated magazine printed and published by Jehovah’s Witnesses. We convinced him that it wasn’t going to be a real problem.” Probably not. Her poetry doesn’t exactly have the same audience as the Jehovah’s Witnesses magazine, since she often questions a god rather than affirming him. The suggestion that Dorianne made for the last line was “in a body like mine,” connecting the image to Amy the poet. The line is more gentler and resonant than the original, yet still physical. Over the summer, I researched where I could have my graduate portfolio printed. Then in Fall 2010, the bookstore at Portland State University (where I am working on a masters in publishing degree) acquired a print on demand (POD) unit. The POD machine is a trial unit to see if it would be cost effective to print textbooks within the university bookstore since shipping unsold copies is expensive. However, while also printing textbooks, the POD machine is also open to students and the public for printing self-published texts and portfolios as the printing press Odin Ink. I discarded my printer research and opted for convenient and timely POD machine. One thing that is nice about Odin Ink is that Portland-Metropolitan area residents can go talk to the POD technicians face-to-face to learn about print options. At the beginning of the term when they work on textbooks, the print time can take a little longer than it did for me, but during non-peak times print turn-around can be a matter of days. I gave the printer three files: one for a small chapbook of my creative work, a classic book (Candide) that I designed, and my portfolio. The two smaller books, the chapbook and Candide, were ready to pick up in two days, and the larger portfolio took five days. This, they said, was typical. The smaller format books came out wonderfully. The margins were what I had expected, the paper weight was heavy enough so that the words from the backside of the page couldn’t be seen, and there were no overall print errors. The larger portfolio, however, did have some errors with the trim. The margins were trimmed down too tight to the text, and some of the coloring was off. The alignment of the text block was also off by a fraction. If I had to guess, since I was printing a large format book (8.5×11) on the color POD, I would say that Odin Ink doesn’t have the kinks worked out of either the color machine, or with working with large format. Perhaps it is the combination of the two. So here’s the run down on prices: The full color portfolio would not be cost effective for Silk Road to print on the POD machine if we went to a large format with any interior color. My 160 page portfolio ran $36 a copy. The smaller format that we currently have (smaller format: less than 8×10) with a black and white interior would run Silk Road $10.15 for an average per copy price. In order to be feasible on the POD, we would have to work out bulk pricing. For the average user (anyone who lives near Portland and would like to print on the POD machine), you can either bring your files straight to the Portland State University Bookstore, or you can publish through Lulu.com and have your files printed on the POD machine. The staff at Odin Ink can do ISBN registration for you, and they also offer cover and book design (all for a fee, of course). I didn’t use these services having designed my books and portfolio myself. It is a strange feeling to see my work in print, even though I printed it myself. It is tactile, it is wonderful, and I love my professional and creative work bound in convenient book form, even if in the end it will just be for myself. And although the POD technology isn’t perfect, and although it isn’t quite to the quality of regular book printing, it certainly is convenient, and it certainly gives writers the option to bind a sample of what they have to offer for future employers, for their family as gifts, or for their own personal pleasure. Or maybe even as a beautiful final example of the work that they have done in college—a thesis, a dissertation, a portfolio. or visit their location on the second floor of the PSU bookstore located at 1715 SW 5th Avenue in downtown Portland. They accept email for quotes on projects.